SACRAMENTO, Calif., August 21, 2017 – A friendly but intensely competitive contest amongst leading event marketing and management firms AtlasRTX, Cvent, Hubb, Splash!, PSAV, Xponet and WorldStage provided attendees of CEMA Summit 2017 with a multitude of innovative ideas sure to change the way events are created, marketed and produced. The CEMA Innovation Shoot-Out featured representatives from each firm presenting a new, never or rarely used idea, concept, tool or practice to CEMA Summit attendees. Participants were required to demonstrate the idea, concept, tool or practice in an applicable way. Summit attendees then evaluated each idea based on a series of criteria to determine the “Best INNOVATION!” winner. 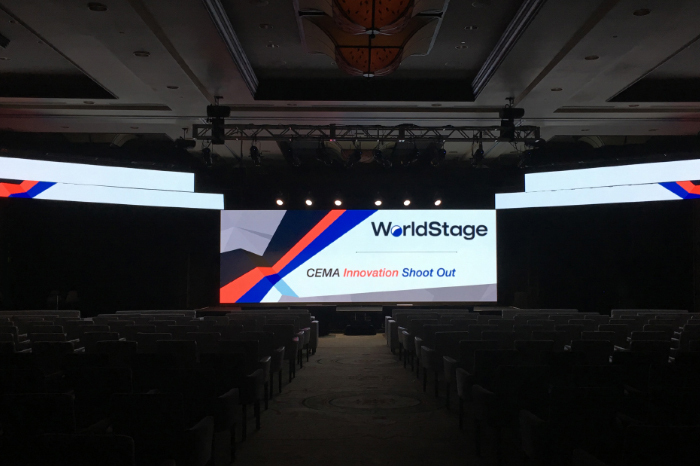 “Each year CEMA Innovation Shoot-out contestants surpass all expectations, presenting brilliant new concepts we’re certain will revolutionize the events industry. Hats off to all who participated in this year’s Innovation Shoot-out and electrified the audience with groundbreaking new ideas. Our CEMA community continues to lead the way in sharing transformative ideas and helping others grow capabilities in the event marketing world.” said Kimberley Gishler, President and CEO of CEMA. at every stage in the buying cycle. Our platform combines A.I. driven chatbots with human-assisted conversations to create real-time experiences that drive attendance, engagement and sales, through relevant, on-demand interactions, anytime, anywhere, in any language, without a full-time staff to support it. PSAV is a leading provider in the global event technology services industry delivering creative production, advanced technology and staging to help our customers deliver more dynamic and impactful experiences at their meetings, tradeshows and special events. As the event technology provider of choice at nearly 1,500 leading hotels, resorts and convention centers throughout the U.S., Canada, the Caribbean, Mexico, Europe and the Middle East, PSAV’s customers comprise event organizers, corporations, trade associations and meeting planners. Our customers choose PSAV for its innovative and comprehensive service offerings, as well as our exceptional customer service from more than 8,500 highly trained staff across a global platform. Visit us at www.psav.com and company.psav.com. and travel the world with some of the largest technologically advanced events in the business to provide a temporary network and the network support team needed within the venue of choice to make their event a success. peers and partners. CEMA promotes professional networking opportunities, facilitates peer-to-peer knowledge sharing and drives industry standards. Through strong relationships with strategic partners, CEMA creates solutions to business issues. For more information, please visit http://www.cemaonline.com or call (916) 718-9802.